I'm better today, not great but better, if anyone was wondering. I had the opportunity to serve the community last week, today, and next week. A woman at church signed up our ward/congregation to do a weekly route for Meals on Wheels. When you sign up you're in for a 3 week stint. The first week I was trained by the previous person (her kid was sick so I got the afore mentioned woman), this week I go it alone, and next week I train somebody new. I was a little worried about going by myself. I didn't want to get lost and take forever, so I took my dad with me. He has a GPS in his head after he studies a map. Pretty cool. I put the sign in the van window and off we went. We delivered 18 meals, in the on and off again rain, in about an hour and a half. Not bad. Hopefully we left those 18 people a little happier. Last week when I met the woman at the kitchen to pick up the food I couldn't get over how many elderly people participate in this program as deliverers not recipients. It's amazing. If I didn't already have a few commitments I would consider having a weekly route of my own. It's a good way to serve/give back to the community. What are some ways you serve/give back? 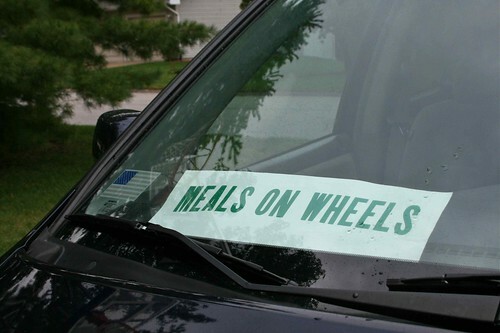 Meals on Wheels...Wow, thats really cool! Good job, Kelly! Glad you're feeling better. NIce! I didn't know you got a special sign to put in your window. Now that's official business right there. Good job Sweetheart! The sign lets me park where ever I want. It doesn't seem to work on older people when you're in "their" parking spot. But I can double park and park in a no parking zone all I want. Not that I get to do anything that exciting. I also have a badge that makes me an "official" volunteer.